your toons until you have some magic jammers ready. Then, it can be quite deadly indeed. it is very expensive, LP wise, to keep toons active. Summoned Skull are really rare. your opponent in the blink of an eye. Scott Gerhardt I refuse to rate this card. The card is what I call a "Deck Required" card. If you want to play certain types of cards, you need certain other cards. You wanna fuse, you need Polymerization. If you want Toons, you gotta play Toon World. For me to review Toon World, I would have to do a complete review of all toons and their effectiveness. I won't do it. For what Toon World does, it gets a 5 - it allows Toons to be played - something nothing else does. If you're not playing Toons, it's worthless - a 1. The card is blatently not deserving of a rating. directly? Bhwhahahahahahhahahahah Oh yeah, I have megamorph to. you can't attack the turn you bring it out. That what makes toons horrible. decideds to release the structure decks, other than that, no good toons. card, but since it's a must use in Toons, you have to use it. Conclusion: <Pegasus>Ohhhhhhhhh my! You destroy my beatiful toons! No no no! <YoNeX>That's your fault for stacking your deck with Toons and Toon World. It's Thursday, and judging by the episode of the anime that is showing today (Yugi vs. Pegasus, part 3), it's a good day to look at probably the most popular card among newbies from this set, Toon World. Yes, it has no other effect other than the cost, but that's not important. The fact is that you need this card to summon any of the Toons in the set. Personally, I would stay away from Toon decks for the time being. Toon World is too vulnerable a card, and if it gets nuked away, all your Toons are taken with it, leaving a possibly open field for your opponent to burn to the ground. 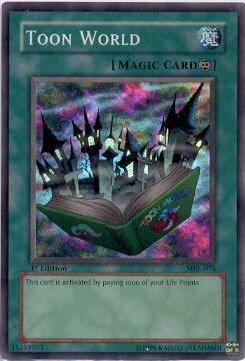 You can counter this with Giant Trunade to return Toon World to your hand (since it's not destroyed, your Toons will live), but you won't be able to summon any more Toons until you repay the 1000 LP cost to place this card back into play. A single Mystical Space Typhoon can lose the game for you. Wait until the Pegasus Structure Deck, when we get the much better set of Toon cards. Toon World gets a 2.5. Toon cards just aren't really viable yet, and Toon World is way too vulnerable to be effective. Just you wait, however. Toon decks will be formidable eventually. *Before I review this card, Id like to say something about my pass COTD review on House of adhesive tape. I was under the wrong impression about this card vs. flip effects. *Curses his local upperdeck judge* Anyway that card CANNOT negate flip effects. This is because it kills the monster that was summoned BUT it didn't negate the summon so the flip effect will STILL HAPPEN. Anyway sorry for the confusion. This also applies to trap hole and eatgaboon. Okay now to the toon world. Hmmm.. 1000 Life points to get your toons started. Seems like alot but actually it isn't. Well heres some easy tricks. Since toon world has to be destroyed for your toon monsters to be destroyed also. Play giant trunade after summoning a toon or 2 out and there you have it. They will stay out on the field and wont be weak to a heavy storm attack. Still your toons will be weak to the usual monster removal but better than having them ALL destroyed just because your opponent mystical typhooning or despelling your toon world. Thats one effective combo for toon world. can easily get nuked by just about anything. Skull in play either.... that thing hurts!! !